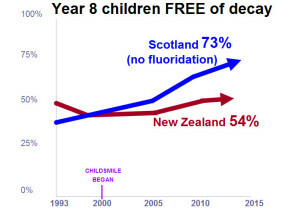 CHILDSMILE is a national programme designed to improve the oral health of children in nonfluoridated Scotland and reduce inequalities both in dental health and access to dental services. 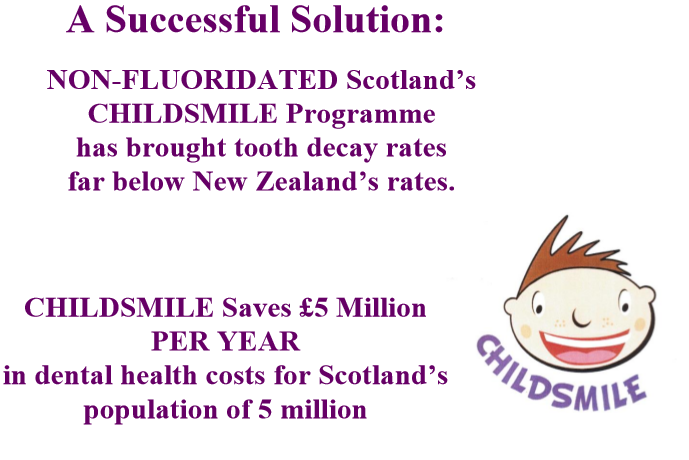 The CHILDSMILE Programme is available throughout Scotland. a Dental Pack containing a toothbrush, tube of 1000ppm fluoride toothpaste and an information leaflet on at least six occasions by the age of five. Both parents and children receive education on healthy eating. How does it compare to New Zealand? Scottish kids used to have worse teeth than Kiwi kids. 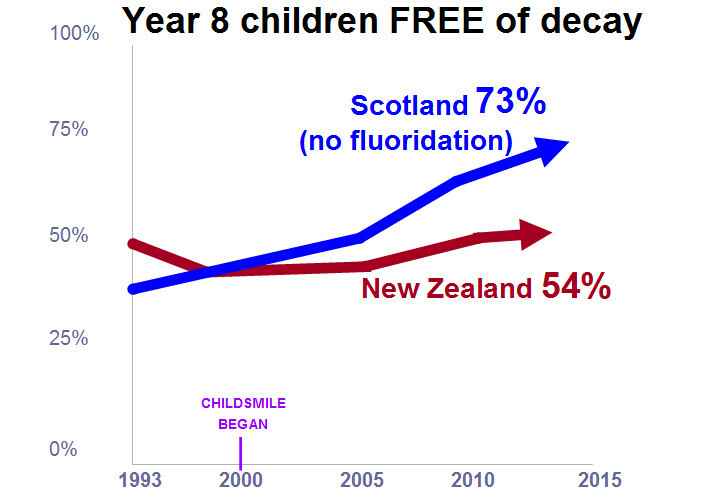 But today far more Scottish kids do not have any dental decay and, those that do, have less fillings. They have also reduced the number of children needing General Anaesthetics surgeries for severe dental decay. They have done this without any fluoridation AND they have saved money. CHILDSMILE – A Successful Solution. One of the biggest differences is that all children are offered supervised tooth brushing in pre-schools and primary school classes. Research indicates that tooth brushing is one of he most important factors in reducing dental decay. 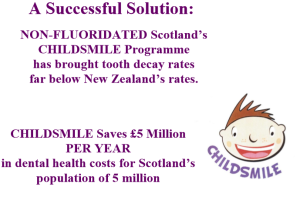 As well as our booklet and short video, which provide a summarised overview, we have compiled an in-depth analysis comparing the outcomes of Scottish CHILDSMILE program to outcomes in New Zealand. Do other countries have similar programmes? A number of other countries have adopted similar programmes to the CHILDSMILE programme. Wales has implemented Designed to Smile which is very similar to CHILDSMILE. Japan and Thailand have also implemented tooth brushing programmes. Does New Zealand have any programmes like CHILDMSILE? Another way to combat tooth decay is for schools to adopt “no junk food” policies. This not only reduces dental decay, but improves overall health. Stuff article 8th March 2018 What happened when two Decline One primary schools ditched junk food?